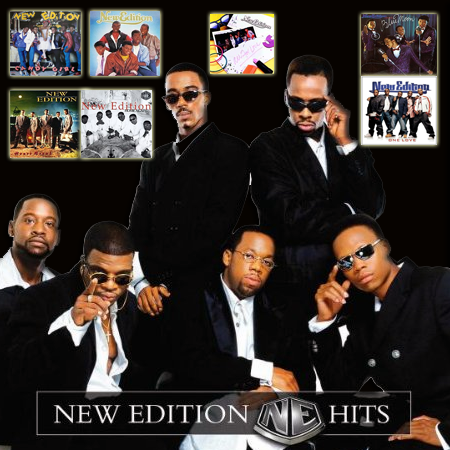 Why the world still need New Edition…. Seems like many moons ago, looking back at 1983 when I first got to know the music of New Edition. Candy Girl was the first release for an album that changed my childhood, which I will explain later. The musical sounds of Ralph Tresvant, Ronnie Devoe, Bobby Brown, Ricky Bell, and Michael Bivens that formed the group New Edition and gave this inner city child some encouragement. We’ve seen acts from children, like the Jackson 5 and others, but New Edition was different. Different because I was growing up with them, from the first school crushes with the pretty girl sitting next to me, to my first pimple and my first bout with puberty. There was a sense of attachment to the group New Edition because they started where I started from; they had the god given talent to show an inner city child like myself that hard work does pay off. So the music came, and so did the memories that I will carry for the rest of my life. A lot of people say that music can not only carry a tune, but also carry a lifetime of memories and it does for a lot of reasons, good, sad, and in-between. So as New Edition evolved and as the boys became men…the group was still relevant and needed. The addition of Johnny Gill during the release of the still classic N.E Heartbreak release in June of 1987, the best was yet to come…or so we thought…. With the group in hiatus after the Heartbreak album, we started to see history form in different directions. Bobby Brown was already making history with his solo projects; Johnny Gill’s album in 1990 took off and reaches platinum status. Ralph Tresvant’s solo debut also released in 1990 was a success with a platinum project, and the 3 man team of BellBivDevoe took the world by storm with their release also in 1990 reaching platinum status. We experienced New Edition separate, but still united and matured making historic music that will forever withstand the test of time. The reactivation of the now 6 man team of New Edition resurfaced in 1996 and again…music that is timeless and memories resurfaced. This group has accomplished something that the world has never seen. N.E embarked on solo projects and reached platinum success & also returns and pick up like it was back in 1983 again. Now I gave you a span of music that changed my life, as I stated so let me tell again why New Edition is so important to me and what I have done in my career. Every member of New Edition is talented, with god given abilities, and as I stated earlier, this inner city child was encouraged and inspired by working extra hard and making some memories myself. Not singing and performing, but by refining my craft of journalism, but also in other career paths I have embarked upon. Music is that kind of tool with tremendous power, and as a man then a child back then, I had no idea that we were listening to and watching music history unfold. We need New Edition because the music industry needs them. As fans, we have taken a group like N.E for granted due to lack of supporting them at concerts, purchasing music, and social media neglect on some occasions. What’s important to us as fans is to show New Edition that this business of entertainment can change with a dedicated fan base, and all 6 members of New Edition reactivated once again to show the world that new music can last 100 more years is a realistic goal. The road started with Candy Girl, and the journey has not come to a conclusion because with all 6 members alive and kicking, New Edition is still needed.